I found the bassoon photo with flickrCC (reviewed below), then used Nota to add labels and arrows for the instrument parts. I changed the background to this lovely shade of green and added a link to a Wikipedkia article and also the link for the photo attribution because it was a little hard to see on the photo.One of the things that I'm asking my second year instrumental students to do this year is to find a picture of their instrument and label the parts. This would be a great tool for this if I can get all of the COPPA requirements met. Simple, quick and easy to use. Can embed as html image (like above), i-frame, or Facebook. You can also email, link, or even print it out. You can upload pictures or find pictures from Flickr or My Photo. You can embed video from YouTube and information from Wikipedia. You may also use textures and clipart from the site along with other members Notas, and everything can be drawn on with a pencil tool. You can even create multiple pages and link them together like a scrapbook or ebook. Your Nota can be set to allow members to edit or not edit and you can allow or not allow comments. Non-members (or Guests) may leave comments. In private beta right now (7/15/08) but you can contact them and ask for an invitation and once you join you have 50 invitations. Only 2 choices on fonts (serif and non-serif). 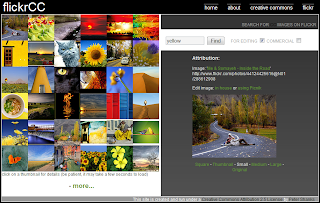 This site finds Creative Commons pictures on Flickr, gives you the attribution information (you can even add it as part of the photo), and gives you the options of editing it onsite or on Picnik (a nifty, free online photo editing site).To save the photo that you have chosen, right click and save. You have numerous options to upload if you use Picnik, not to mention lots of options for eye candy.This is what I used to find my bassoon photo in my Nota above. Will also look for Creative Commons photos on Flickr, but only links to the original picture and doesn't give attribution information. Also no editing.